Twelve enterprising women, who accompanied their husbands to Wayne where they would conduct business, first met on Saturday, February 16, 1886 in Wayne Hall (no longer standing) adjacent to the Wayne Presbyterian Church. 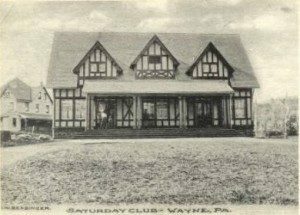 And so The Saturday Club – one of oldest women’s clubs in Pennsylvania and nationwide – was born. Meeting programs usually took the form of papers presented to each other on such topics as literature, science, art, music, and matters of the household. In 1894, the club’s purpose became more oriented toward activism with the addition of the Philanthropic and Legislative sections. In 1895, when Saturday became a school and business holiday, the club’s meetings were changed to Tuesdays. The name of the club, however, remained unchanged and today, the club continues to hold its monthly membership meetings on Tuesday evenings. In 1898, club members pooled their resources to purchase the lot and build the clubhouse where it still stands. Designed by architect David Knickerbocker Boyd and modeled after William Shakespeare’s home in England, the Tudor-style building was placed on the National Register of Historic Places in 1978. 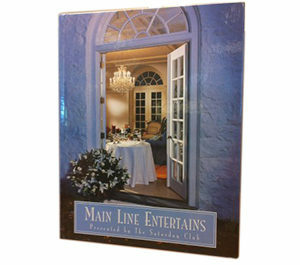 In addition to its philanthropic efforts, the club has published three award-winning cookbooks – Philadelphia Main Line Classics (1982), Main Line Classics II: Cooking Up a Little History (1996), and Main Line Entertains (2005). 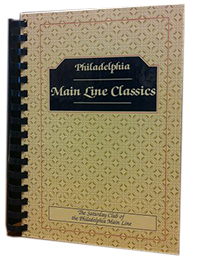 In 1982, The Saturday Club published its first cookbook, Philadelphia Main Line Classics. Now in its eigth printing with over 75,000 copies, the cookbook boasts over 700 recipes and features station stops along the Main Line. The cookbook features wonderful illustrations of the stations by Jane Curtis and histories of each town. From 1982-1996, this cookbook enabled our club to donate more than $170,000 to charities in the greater Philadelphia region. 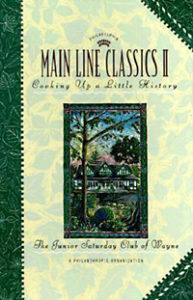 Our second award-winning cookbook, Main Line Classics II: Cooking Up a Little History, was published in 1996. It was introduced on QVC’s “Best of Pennsylvania” show and won many accolades including the 1997 Tabasco Community Cookbook Award. The cookbook contains over 400 kitchen-tested recipes and includes ghost stories, secrets, and folklore of Philadelphia’s prestigious Main Line homes and historic taverns.